Science fiction lost a legend last week when Sir Arthur C. Clarke passed away at the age of 90. To begin our tribute, the Book of the Week is the 1954 first paperback printing of Sir Arthur's first book, Against the Fall of Night, cover art by Richard Powers. Set far in the future on an Earth mired in decay, Against the Fall of Night tells of a young man named Alvin, who sets out to recapture past glories. The novel was first published in shorter form in the pulp magazine Startling Stories in 1948. Even though the book was well received when republished in the early 50's, Sir Arthur was dissatisfied with it, and entirely rewrote it as The City and the Stars, which first appeared in 1956. Such is the power of Clarke's imagination that both versions remained in print for many years. As discussed in a prior BOTW about Childhood's End Arthur C. Clarke is best remembered outside the science fiction genre as the author of 2001: A Space Odyssey, while his most influential book within the genre was Childhood's End. But perhaps his greatest contribution to humanity was originating the concept of placing communications satellites in geosynchronous orbits -- to this day often called "Clarke orbits" in his honor. An underappreciated aspect of Clarke's career is his outstanding short fiction. You will see the first appearance of my personal favorite Arthur C. Clarke short story next week. I (Amy) have not read any of these books. Not yet anyway. I foresee that these will be part of my future reading materials. The Book of the Week is the first printing, paperback original edition of I Am Legend by Richard Matheson, printed in July 1954 by Gold Medal Books, cover art by Stan Meltzoff. This was a highly collectible vintage paperback even before the success of the recent Will Smith movie. That film was the third film adaptation of I Am Legend. Will Smith's role of Robert Neville, the last man on earth, was previously played by Vincent Price in The Last Man on Earth (1964) and by Charlton Heston in The Omega Man (1971). I'd say the recent film was the best of the three versions -- although many viewers fondly remember The Omega Man, it has not aged terribly well. Richard Matheson has generally fared much better in Hollywood than most science fiction and fantasy writers. Even if you don't recognize his name, you would recognize some of his creations that have appeared on the screen: that creature staring at William Shatner / John Lithgow through the window of an airplane (The Twilight Zone); the vicious little doll attacking Karen Black (Trilogy of Terror); the creepy ghost girl appearing to Kevin Bacon (Stir of Echoes); the possessed cat in The Legend of Hell House; the faceless truck driver menacing Dennis Weaver (Duel, Steven Spielberg's first film); reporter Darren McGavin taking on vampires and succubi to get the story (Kolchak: The Night Stalker); Christopher Reeve willing himself through time to meet Jane Seymour (Somewhere in Time); Robin Williams traveling into the underworld to save his wife's soul (What Dreams May Come); Barbara Eden realizing that her unborn child is controlling her actions (The Stranger Within), and many more. Next week's BOTW will be another early Richard Matheson novel, his very first book to be adapted to film. After a couple weeks' hiatus (because I couldn't get my scanner to work), the Book of the Week is Glass Houses by Laura J. Mixon. This is the first printing, paperback original of the first book for adults by Laura Mixon, wife of our last BOTW author, Steven Gould. 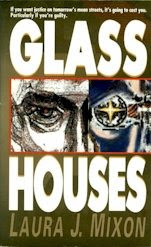 Glass Houses was a noteworthy work of cyberpunk, a subgenre we will return to in future BOTWs, but sadly the cyberpunk movement was nearly played out by 1992 -- its death knell came when non-SF geeks started using the term "cyberspace," signaling that it wasn't our playground any more. Cyberpunk is another thing Hollywood has yet to get right, although the first Matrix film wasn't too far off. Next week's BOTW will be a science fiction novel that Hollywood did a more creditable job with recently.